No matter how lovely the decor, if your kitchen appliances don’t get the job done, it’s just another room. In Baltimore, Lutherville, Annapolis, Columbia, Bel Air and across Maryland, Kenwood Kitchens has been providing top of the line kitchen appliances for over 40 years. When you demand the finest countertops, cabinets, and flooring for your kitchen remodel, the appliances you choose should meet those same high standards. At Kenwood Kitchens, we only offer the very best in high-end, premium quality, kitchen appliances, including Subzero, Wolf, Asko, Miele, and Dacor. Subzero is the industry leader in high-end, high-quality, high-performance cooling units. Whether a wine cooler or a full-size refrigerator, all Subzero kitchen products are hand built in the U.S. by professional craftsmen. They also feature the innovative dual refrigeration system invented by Subzero which utilizes microprocessors to keep everything fresh and safe. 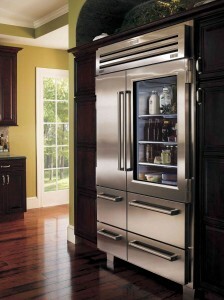 Rounded out by heavy-duty hinges, magnetic doors, tight seals and a concentration on sustainability—it is no wonder that these refrigerators remain the top refrigeration choice for fine kitchens. Wolf is synonymous with cooking, offering the highest performing stoves, grills, cooktops, gas and electric, heating drawers and ventilation. Top quality chefs—both home and professional—rely on Wolf’s technologically advanced cook-surfaces to be even, perfect, and precise. 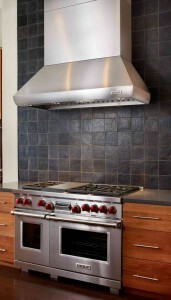 No other major appliance manufacturer offers the kind of service a Wolf range will offer your cook space. The difference between a good meal and a great meal is often the value of your hardware. Asko has a legacy of clean, efficient, quiet, and long-lasting appliances—These washers are environmentally friendly, lovingly crafted, and the utmost of style working to fit seamlessly into your cook space. Dacor is quality personified. This exclusive high-end manufacturer of stylish kitchen appliances is featured in the home kitchens of many of the nation’s top chefs. Everything from microwaves to ovens has been constructed with an eye toward both form and function, blending the latest in technological innovation with the sleekest in contemporary kitchen design elements. To start creating a cooking space that is a pleasure to use, call (800) 211-8394 or contact us to speak with a representative.